The year is 2011 and this is a review about a story in 2003. Oliver’s parents Hal and Georgia marry in 1955. Georgia dies in 1998. Hal comes out as a gay man after her death at 75. He dies in 2003. Beginners is a story about sorting out the past as we proceed through the present – also known as living. Oliver is sorting trash. Plastic garbage bags fill up and a tray of medications gradually find their way in the belly of a toilet. * Memories of Oliver’s late father are also sorted: We see Hal admit to his son that he’s gay in a purple v-neck. Oliver then acknowledges via voice-over that his father was actually wearing sleeping robes. In the midst of sifting memories for fact and fiction, Oliver meets Anna at a costume party. As the two get closer, hitting inevitable speed bumps, we fling our hearts at the screen, hoping the characters will see that the way they fit together is like poetry: each one is half of a damaged rhyme scheme, requiring the other to be complete. Hal’s lackluster affection for his wife during their 44 years of marriage has obviously had an impact on Oliver, but the final years as an openly gay man pursuing a relationship show what love can look like. When Oliver nerd-ily tags buildings with lines like “1985 Bush found Jesus” and tells his buddy he’s increasing historical consciousness, you know the film is not riding the standard romantic drama track. The transitory, unreliable nature of memories is a central theme and breezy editing mirrors the content: the traditional linear narrative is thrown aside and Oliver’s memories slide in and out of scenes like a well shuffled deck of cards. Ewan McGregor is perfect as the son lost in a sea of half-baked memories, the narrator guiding us through the decade shifts with the weight of the time tugging at his voice. When he comes across Mélanie Laurent as the pensive Anna, she convincingly shows that her waters run just as deep. McGregor and Laurent’s playful interactions and intimate moments play out with the childish verve of first loves. When love looks this natural, you know you have actor gold. And let us not forget Christopher Plummer, whose portrayal of Hal will have you cringing at his fatherly awkwardness just as often as you’ll be swallowed by his sincerity. Since Hal is only resurrected via Oliver’s memories, it’s a shame that we don’t see more interactions between McGregor and Plummer (McGregor is almost reduced to passive passenger). Oliver’s narration swings in too many times to interrupt the film’s flow and it can’t decide if it wants to be a gay rights historical drama or a romantic one. Nonetheless, the content and method of delivery makes Beginners a weighty piece. The juxtaposition between Oliver’s memories and his present appropriately magnifies the importance of our personal histories on our present. A friend read me a quote some years ago that I don’t have the source for, which will require some paraphrasing: We’re cursed to live our lives in the present without understanding its true meaning until it’s in the past. Beginners shows how we can manage that curse – by using our history to live better, even in the face of hurdles of history and culture. *Public service announcement: don’t do this. 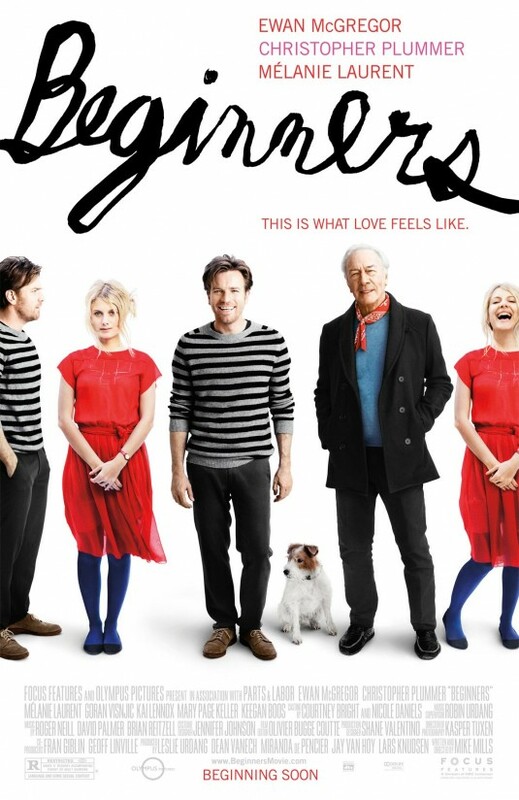 This entry was posted in Reviews and tagged Beginners, Christopher Plummer, Ewan McGregor, Mélanie Laurent, Mike Mills. Bookmark the permalink. Great review! I love the dramedy feel to the movie, it’s very light but also very deep. You should check out my review of Beginners and comment and subscribe!